Trees, is there anything they can’t do? Doubtful. Let’s see: producing half the world’s oxygen, providing habitat for millions of species, creating the soil and timber resources we depend on. Not bad. But all that’s just scratching the surface. As new research shows, there’s a lot more going on beneath the forest floor than we realized. Trees might be the original architects of internet-style communication. Through a web of tiny root hairs and threadlike fungal partners called mycelia, the trees in a forest are connected, swapping nutrients and information. Biologists have known this for years. What they didn’t know was just how much sweet, sweet sugar also gets shared across this woody network. 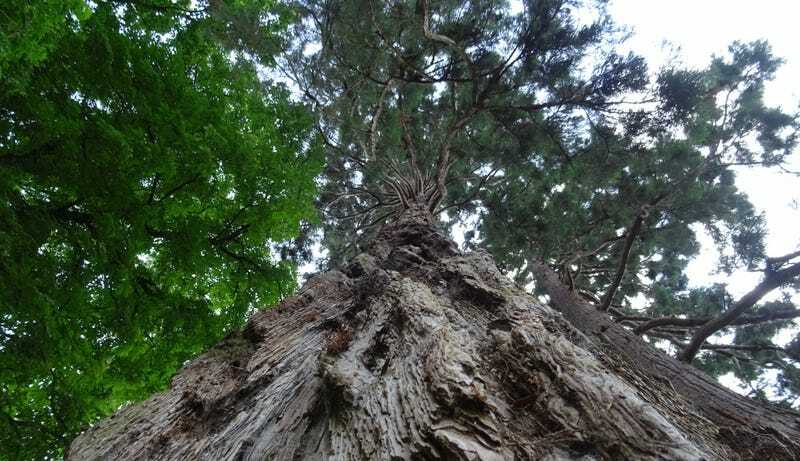 New research suggests that a significant fraction of a tree’s food supply may come from other trees. Tamir Klein and his colleagues at the University of Basel in Switzerland made that discovery almost by accident. They were conducting field experiments to learn how spruce trees will fare under higher atmospheric CO2 concentrations. To do so, they sprayed CO2 with a very specific mix of carbon isotopes into the forest canopy, and traced its fate over the course of five years. As expected, some of the extra carbon was taken up by the spruce trees via photosynthesis. But around 40 percent of it wound up in the roots of neighboring beech, larch, and pine trees. The implications of that are huge. It’s common knowledge that plants grow from the air, mixing carbon dioxide, sunlight, and water to create sugar. But that may only be a half-truth, at least as far as trees go. Trees produce their own carbon, but they also share with neighbors. The researchers calculated that in a single hectare of forest, some 280 kilograms of carbon—four percent of the forest’s total carbon uptake—is being passed through the soil each year. Of course, the study only deals with one forest, in one part of the world. But now that we have solid, field-based evidence for this process, other ecologists are likely to take a second look at what their trees are doing below ground. I have little doubt that whatever we dig up will surprise us.